Equity is the value of an asset after all the liabilities or debts have been paid. Equity instruments that offer ownership in the company in exchange of money are called stocks. It is a type of security that signifies ownership in a corporation and represents a claim on part of the corporation’s assets and earnings. The word “Equity” as is currently used in the finance world, but the meaning of the same word in other contexts where is generally means justice, impartiality or fairness. In financial accounting, the owner’s equity consists of the net assets of an entity. In short, equity financing is the method of raising capital by selling company stocks to investors. In return for the investment, the shareholders receive ownership interest in the company. 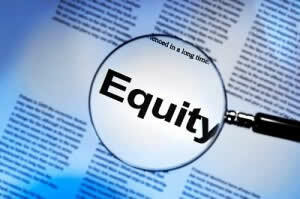 Equity itself may refer to home equity, private equity, equity income of affiliates, health equity, educational equity, etc. Common Stock – The amount of capital contributed by the business’s owners is to purchase company stock. Preferred Stock – This amount reflects the outstanding stock that has yet to be purchased. Retained Earnings – If the company does not pay dividends to its share-owners, then it has the option to reinvest the entire amount of its profits back into the company. If it does pay dividends, then the amount left over after paying out dividends is what is known as retained earnings.